As a lifelong Leeds United fan, no-one would be happier than Leam Richardson to see the Elland Road outfit reclaim their Premier League status after well over a decade out of the big time. 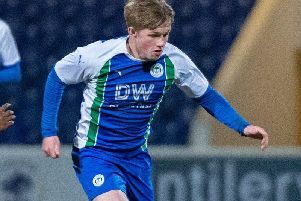 But that doesn’t mean the Wigan Athletic assistant boss won’t be doing everything he can to help derail their promotion push this weekend at the DW Stadium. Even if it means antagonising the vast majority of his family and friends! “I want to beat every team as much as any other,” Richardson acknowledged. “But obviously Leeds being Leeds it does bring that extra spice to the game. “Most of my family and friends are Leeds United fans, and I’m sure it’ll be split on the day as to who they want to win. “I’ll probably know 50 per cent of the travelling support that’s coming over for the game, which will certainly make it interesting! Richardson doesn’t need much persuading to go down Memory Lane and list the stars of his childhood. “Howard Wilkinson was the manager when I started watching...David Batty, Gary Speed, Vinny Jones, Chris Fairclough, Gordon Strachan, Carl Shutt, Rod Wallace,” he said. “Then my era, watching with a few friends, was Alan Smith, Jonathan Woodgate, Harry Kewell...when I was making my way in the game as well. “Me, my dad and my brothers were all season ticket holders for many years. “It was only when I started playing at Blackburn Rovers, and I couldn’t carry on going to games, that I gave mine up. Even when Richardson turned pro, he couldn’t break away from his hometown side. “I was lucky enough to make my professional debut for Blackburn against Leeds at Elland Road, which was pretty special,” he recounted. “It was a dubious 1-0 loss...very, very dubious I have to say! Danny Mills was allowed to take a free-kick twice for some reason. “The first one didn’t go in...obviously the second one did! And Richardson believes the city has waited long enough for a return to the Premier League, which would reward the fanbase that has stuck with the team through thick and thin. “It’s a one-club city, which ensures the affinity from everyone in the place,” he recognised. “It’s very rare you see another football shirt than Leeds United walking around the city. “The fanbase is huge, and you can see that with the way they’ve stuck by the club over the changes in ownership and relegations. “This is possibly the best chance they’ve had of getting promoted back to the Premier League for a number of years.